Pine Apple Cheese? What kind of cheese is that? Does it taste like pineapple? Was it made from pineapple? I had never heard of this cheese before. So I sought out, but in vain, to find a modern counterpart. I was left to go back in time and read up on this mystery cheese. In 1808 a man named Lewis M Norton, from Goshen, Connecticut, was given a Pineapple cheese which had been brought from Holland. Apparently, being a cheesemaker he decided he wanted to make his own “Pine-Apple Cheese” so he began to find a way. 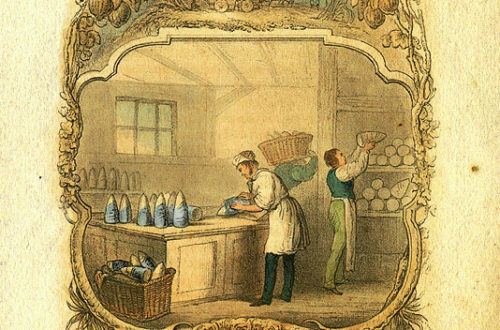 By 1810 he patented the process which creates these fancy cheeses which became a very sought after luxury. Later his son Robert learned the business well and continued to make this cheese through most of the 19th century. These pineapple cheeses were basically a form of cheddar, but much richer. In making them, they would add extra cream to the whole milk. The milk and cream would be heated and the rennet was added. The curd was then put in small hoops and these were put into a 30 x 40 ft frame, which was then lightly pressed for pressure. When pressed and still soft they were put in a small net and hung up which lent to the shape and the pineapple like markings. They would usually soften the cheese in warm water or whey right before putting in the bag so the impression would be strong. These net bags were made of 3-ply flax thread which was woven into bag form. The bags usually lasted several years. They were made mostly by local women for about 12 cents a bag. 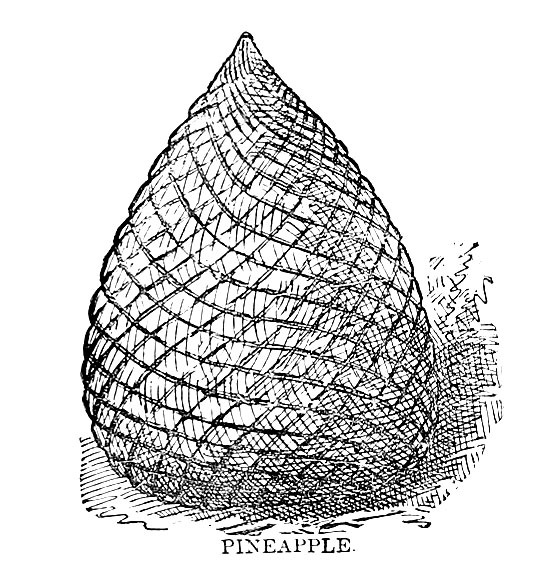 The purpose of the net was to create the diamond shaped pattern to resemble the pineapple. While the cheese was left for a least a month to cure they would paint the outside with boiled linseed oil. This would then harden, prevent cracking, lend to the yellow coloring and make it appear shiny. Sometimes they were even shellacked. These kinds of cheeses were known for lasting a long time in many kinds of climates. Which in a world without refrigeration was quite desirable. This cheese ran about 12 to 14 cents per pound, or at least double that of ordinary cheese. However, during the Civil War the pineapple cheese rose to around forty cents a pound! A luxury indeed! In 1873 1 pineapple cheese, not sure how many pounds it was, went for $2.50. All the same. 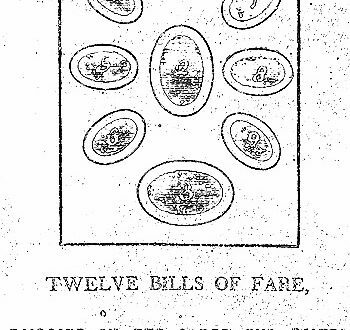 this was quite an expense for people during those times.Later in the early 20th century these cheeses were often used for decorative purposes in markets and stores. The Pineapple cheese season began on April 1st and continued until December 1st. It was continued to be manufactured in Connecticut until sometime in the 1850’s when a Robert Norton began making them in New York. By the 1920s they were being exclusively made in New York. The first three sizes would have been packed six to the box and the last size four to the box, using fibre board with cross sections partitioning each cheese. The store keeper would then unpack them and sell them individually. 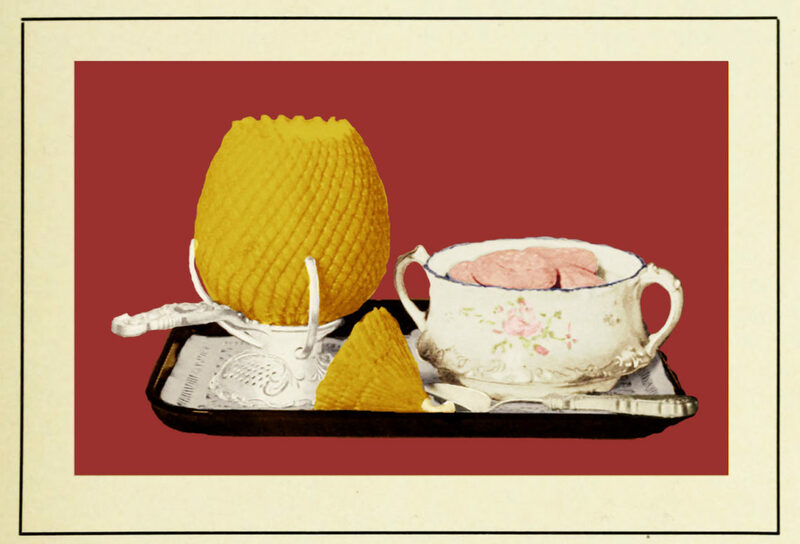 On September 8, 1847 when Robert Norton, the aforesaid son of Lewis Norton, was married to Julia Ann Horsford, his father cut a pineapple cheese which had been curing for twenty six years, the same age as the groom. So how did Mr.Norton cut his son’s wedding cheese? Well very likely he did so in the fashion outlined in so many magazines and books. First the cheese was placed in a cheese holder – made specifically for this purpose. The upper portion was to be cut forming a kind of lid. Sometimes a silver knob was inserted into the top portion for ease of handling. The cut could be plain or fancied with notches, as depicted in the first illustration. Summertime or warmth could make the outside of the cheese oily so it was suggested to wrap the cheese with a napkin when handling. A cheese scoop was used to gain the interior cheese. If you did not have a cheese holder you would simply wrap a decorative napkin around the cheese and stand it on a dish. CHEESE SHELL FILLED WITH CREAMED CABBAGE. A small head of young cabbage should be boiled in salted water until tender. Drain, chop, and season it. There should be two cups. Put it in an empty Edam or pineapple cheese shell in alternate layers with one cup of white sauce No 2 (see below). Heat in the oven until the sauce bubbles. This will give the cabbage a delicate cheese flavor. Boiled macaroni or rice may also be reheated in cheese shells to advantage. Melt the butter, stir in the flour and seasoning and cook slowly without browning until the mixture bubbles. Remove from the high heat, add the milk gradually, beating and stirring constantly until the sauce thickens. Fill pineapple cheese out of which the cheese has all been scooped, with creamed cauliflower. Place on folded cloth in pan sprinkle grated cheese over the top, and bake in moderate oven twenty minutes.